2011 started out with our attendance at the annual British Brigade and Continental Line meeting in January where we discussed events past, present and future. Febury 17th had the usual suspects attending the Meeanee Day Dinner at Finnagles Pub in Clinton NJ. This Year’s dinner included a reading of the names of the twelve men of the 1st Battalion who were killed on the last Afghan Tour followed by a moment of silence and the reading of the Regimental Prayer. March saw our return to McKonky’s Ferry (Washington’s Crossing State Historic Park) in Taylorsville, PA for our usual garrison weekend. The River once again tried to thwart our plans but we were able to have a successful event and the bridges stayed open. 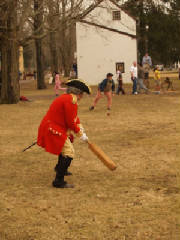 The Captain is Quite the Sportsman! In Early June Gavin and I represented the Regiment at the King’s Birthday Celebration at New Bridge Landing in River Edge, NJ. This is a very interesting event at a site that is basically the NJV’s home base. 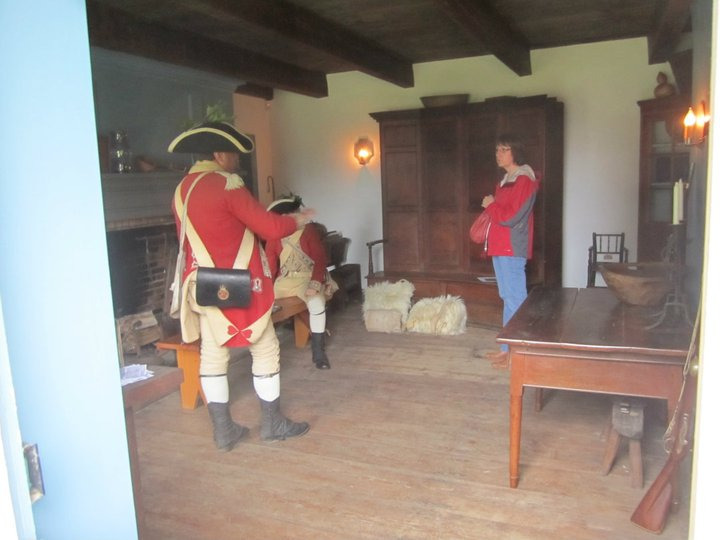 The staff is very pro living history and I hope we can increase attendance here. 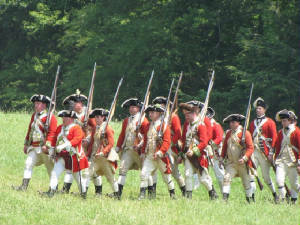 Late June saw the Regiment on the road again to Tidewater Virginia for the Under the Redcoat event in Colonial Williamsburg. Once again we brigaded with the 55th, 23rd and 33rd to form a super company of hat men. The Rebels never had a chance. Our newest member (at the time) Pete Graible attended and proved to be one of those “instant soldiers”. We welcomed Mike Cilia back from a long deployment on the other coast with the Navy. Welcome back Mike, once a Cheshire always a Cheshire. As much as I am loath to”rub it in", if you were not one of the happy few who attended the Wyoming event you missed a really good one. Let's start at the beginning, as they say. Friday afternoon Sergeant Krentler, his son William, Private Gavin and I met and set up our tents and a couple of unit tents. After that chore we were a little warm so we took to the woods and the cool shade. We decided this would be our kitchen and general gathering place. The spot we chose straddled a woods road at its entrance into the wood and that entrance seemed to create a natural draft caused by the temp differential. The resulting breeze kept us cool and kept the bugs mostly at bay. Steve and I noticed a lot of bluestone shale in pretty big slabs so we went to work building some stone benches for the lads to sit on. In the same woods to our left was the Highlander primitive camp and to our right the 62nd had a very light camp. There was an organized camp kitchen area but that area had no shade and since we were going light and had no fly we decided to make our fire in the woods. I suggested since there were plenty of flat slabs of stone that we use one of them for the fire and forget about digging a pit in the rocky ground. I then went to put the rest of my gear in my tent and when I returned I found that Steve, with the boy's help, had created a stone hearth complete with a raised cooking area and chimney. Around that time John Torkos with his two boys Johnny and Tommy, Tom Doyle and Drummer William, Pete Graible and Gary Vorwald arrived. This would be the 22nd's strength for the weekend. We had planned to go out to eat together on Friday and after we were all settled we left to eat around 9:00 PM ( a little late for rural PA). I had done some recon on the way and noticed a place called Back Draft on the way in. It was an interesting looking place from the outside, advertised as a restaurant and bar with a firehouse motif. That was in the light of day. At 9:30 when we got there, with half a dozen starving kids and as many men, we noticed that the thud of heavy bass dance music penetrated the walls and disco ball lights shone through the windows. Torkos and I went in to do a recon and probably would have done a thorough job of it but the starving children burst in close behind us and sent the bartender into a fit of propriety. We decided to go to the back-up place, which was a family owned diner, and they were more than happy to serve all eleven of us at 10:00 PM. It turned out to be a pretty good feast. Friday night was just the right temperature for sleeping with a blanket. There was a bright full moon both nights which made it easy to get around after dark without any need for a flashlight or lantern. In the morning the camp stove proved itself by bringing a camp kettle of water to boil in about ten to fifteen minutes. Steve had warned me that it would be a busy morning and I should have the men ready by 9:30 to fall in with the 43rd while was he with the Sjt. Major and tending to his duties as Second Brigade SM. I needn't have worried with the select crew we had. Everyone was ready without encouragement and we were at the 43rd's assembly area in plenty of time. We formed the fourth section of the company with some lads from the 54th foot. The sections on Saturday each had eight Hatmen for a total of 32. We also had two officers and three sergeants. All three brigades had around 100 men each. We had first formation and safety inspection and then were dismissed for some company drill. We had a short break and then formed up for the Color Ceremony around 11:00. Once again BB Officers provided comic relief. We then marched off to battle. The best part of the first battle was in the cool woods along a stone row, waiting to ambush the Rebel Militia. All good things must come to an end and we were soon blasting the hapless Rebels from the woods which quickly filled with powder smoke. We pushed them out of the field they were in and followed them along a road that passed through a wooded ridge. On the other side of the ridge there was another field that dropped away in two rolling steps. We formed up in the open woods at the edge of this field and advanced after the Rebels. We kept up a steady fire and pushed them below the second swale when something happened and the Rebels surrendered. We then marched back to camp for a lunch break. After lunch we formed up and marched out to the second battle. This time our brigade formed up on the far side of the wooded ridge from where the last battle took place. We had some time so we hung out in the shade of some oak trees and waited for things to develop. The 1st Brigade was soon engaged below the second step and the 3rd seemed to be engaged in the woods to the left. It was not much later that we were called to join the fun. We went down to the bottom of the steep field and prepared to pass through a narrow opening in the woods between that field and yet another beyond. We passed rapidly through and engaged the enemy with a running fire supported by the 43rd's Battalion Gun. Then something happened and we here pushed back through the opening back to the hilly field and we surrendered. I saw Steve Santucci and Andrew McClain on the Rebel side at this time and we met later in camp. It was very nice to get back to our cool and shady camp in the woods. After cooling down we took a stroll down to the suttlers who were in great abundance. We had a nice dinner of chicken, sausage, bread and cheese. I was going to visit the Rebel camp but fell asleep. Later there was a night action that we watched it through the trees like a fireworks show. I'm sure we won. Sunday was very leisurely for us. 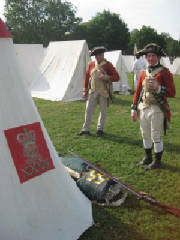 Although there were two unscripted tacticals in the morning we chose to stay in camp and work on muskets and kit. I'm sure we won. As I moved around camp I noticed that it was markedly warmer than Saturday. We formed up after lunch. The 43rd was down some men but all the 22nd was there. With the 54th we formed a ten man section and the 43rd had two ten man sections still making a nice sized company. The fight would mostly take place in the far lower field that was on the other side of the woods with the narrow cut and bordered by a large pond on one side and the Rebel camp on the other. Insert music at this point, Ride of the Valkyries or the music from the Fort Wagener battle scene from Glory (O Fortuna - Carmina Burana). We were forming on the hilly field when the Rebels made a try for our gun but were repulsed by the First Brigade. (go to my Face Book page to see a video of this action from the Rebel perspective). We then all moved quickly out into the lower field and re-formed. As soon as we re-formed we started trading volleys with the Rebels. All of a sudden, the Officer of the 54th got our attention and was pointing behind us. Here came our Native Allies running through the cut we had just navigated like they were being chased by Devils. Right behind them were the Rebel light infantry! Our section went to the right about and met them with a solid volley before they formed and continued to hold them off with rapid independent fire. Soon the threat was contained and we re-joined the Company which was facing the main Rebel threat. As I saw it, the Rebels were anchored on our left by the pond and threatened by the First Brigade. On our right the Rebels had refused their flank and were hard pressed by the 3rd Brigade. Our thirty man company faced the angle of the Rebel line, just as they were trying to move a gun into position. Our Officers recognized a golden opportunity (pointed out by some NCOs) and had us fix and CHARGE! Let us say a melee ensued and my perspective shrunk to the field piece being frantically withdrawn in front of me. 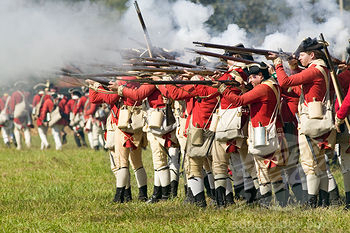 I and another lad from the 43rd laid hands on the gun but had to turn to deal with some Rebel Riflemen who got behind us. Needless to say they didn't have bayonets on their rifles. Friends, at this point I have to say that I recognized that running 30 to 40 yards after a rapidly retreating cannon in 90 degree heat etc. etc. I spent the rest of the battle under a shade tree and saw the army split and then finally box in the Rebels. There was a lot of noise and smoke. I heard a lot of huzza's so I started back up the very hilly field to our camp. I'm sure we won. I have a couple of general or after thoughts. The pace and violence of these battles were impressive. We work very well with our comrades in the 43rd and 54th. At one point we formed "triangle" against horse. This is an expedient way to protect against horse with only a limited number of men (be prepared to see this again soon). William Doyle is shaping up to be a solid drummer and held his own with his older colleagues. This was a great event and a great site. If I missed anything lads please chime in. It was good to fall out with the comrades who were there and I missed those who couldn't make it. I hope to see you all at the end of September at Mt. Harmon! P.S. We missed the Mount Harmon event this year. I don't have many pics of this event but clisk this link to see some great shots that Gary took! Lightbob Tommy Torkos and two young lads from Canada who were under their command got caught between the battle from one field to the next. 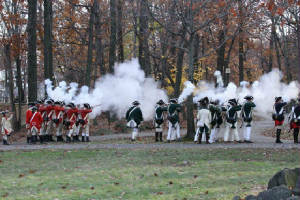 They had been told to stay behind the guns prior to this battle as they marched with us into action. Unfortunately, the Royal Artillery was very active like an assault gun battery from WW2 and moved with the line infantry as if mechanized. Our boys followed them right onto the field of battle without our notice following our orders. As mentioned earlier we ran into a major counterattack and were forced to fall back. We blew through 3/4 our cartridge boxes in that lower field and lost sight of our boys. We were ordered to fall back at the double quick and in all the confusion and activity I know I lost all thought of the lads assuming them safe with the spectators on the hill to our rear. We (the combined 22nd, 43rd & 54th) had already fell back through the cut to set a rear guard at the beginning of the second field to allow the rest to fall back, so we got to see to our surprise our boys in with bits and pieces of 22nd uniform with their toy guns falling back in good order in a hurried retreat with the rebel forces bearing on them. must of realized these small soldiers out of place put a fear of God into them that I have rarely achieved myself. who were reforming under the shade of the wood line. I march across the back of our reformed lined and found them at the order in line with their eyes as wide as saucers and gasping for breath. I advance to the boys ordering them to the front march then a right turn and brought them up the hill to the shade by the civilian spectators and told them to stay out of trouble. They followed those orders to the letter. Later my sons chastised me for getting them yelled at by telling them to stay behind the guns. We told them only worry about being yelled at by Cheshiremen and not to worry about Officers, Sergeants, Scotch, Welsh or Irishmen. If they are not wearing Red and Buff, not to take care. They did the regiment proud those lads did. 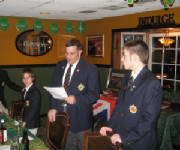 Gavin and I represented the Regiment at the Red Mill in Clinton, NJ once again but this is barely a unit event. The site educator had the public fill out a survey to let them know whether they would be Loyal or Rebel during the Revolution. We attended fort lee once again but this time with a twist. 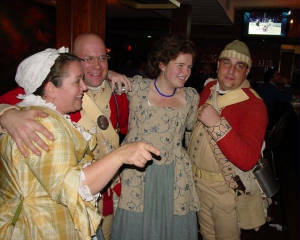 After the Fort Lee activities we all went to New Bridge Landing for a Tavern Night and a day of British Occupation on Sunday. We also were introduced to another “instant soldier” in Tim Kuntz. A veteran living historian, Tim fell right in and will be another great addition to the Regiment! And now on to 2012 and an event in New York City even before Meeanee Day! I promise to be more diligent in the future. Nothing shall distract me!